A hunters favorite area to hunt in the fall of the year is that large hardwood bottom covered with big whiteoak acorns. This area provides food for many different types of wildlife for several months, but when the leaves are gone and the wet winter months come, these areas tend to produce almost no food, browse or bedding areas for wildlife. Landowners at some point have to make that difficult decision of harvesting their timber either when the price is high, when the ground and roads are dry enough to harvest or when income is needed. When this happens, they sure hate to cut that area that they have hunted for so many years. I have worked with landowners over the years to try to develop a plan for their property with wildlife in mind as well as a suitable return on investment. We have accomplished this many times by creating ” mini-clearcuts” of 5 acres , 20 acres or larger areas depending on the size of the property. We may clearcut a 5 acre spot, skip over 100 yards then clearcut 20 acres and move another 100 feet and cut another small area. When complete we have an area of standing timber to hunt in and manuever through next to a clearcut that regenerates with natural habitat, creating a home for deer, nesting areas for turkeys and income for the landowner. 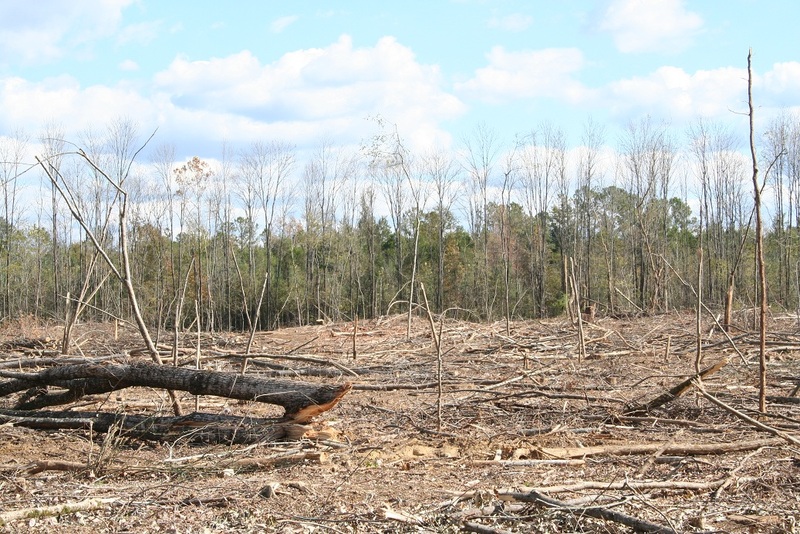 The photo’s below are of Marve Breeding’s 1820 acre timber and recreational land investment in Lowndes County. Marve has implemented several very unique ideas with wildlife and future investment in mind. Here-he is clearcutting an area of undesirable hardwood timber creating areas that will be capable of holding larger numbers of deer and other wildlife.